THIS INCLUDES STABLE & PUTTING IN AM FEED & HAYNET. FULL LIVERY 7 DAYS £95.00 PER WEEK. 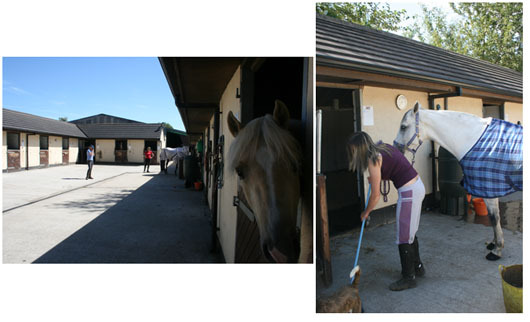 (AS ABOVE ,7 DAYS A WEEK MUCK OUT, FEED AM/PM + NETS,CHANGE RUGS TURN OUT /BRING IN PICK OUT FEET CHANGE RUGS. IF IN WE SKIP OUT PM. (1 BALES SHAVING OR UNLIMITED STRAW & FEED INC. NUTS,GOOD MIX & MOLLI CHOP ANY OTHER FEED OR SUPPS ARE EXTRA ) PLUS SUMMER 7 DAYS POO PICKING. Invoices will be issued 5 days before the end of each month. Payment must be received in full by the due date of every month. Cheques made payable to Dilly's Livery Yard Ltd.
All additional services required will also be charged monthly in arrears. Any requirements must be entered into the livery book – do not rely on word of mouth. Due to seasonal weather conditions and essential paddock maintenance we cannot guarantee grazing 365 days of the year. However we do endeavour to provide as much turnout as possible and if the field is not available then there is a small turnout paddock available. In order that we can keep our horses out for as long as possible it is essential that ALL DIY LIVERIES MUST CONTRIBUTE TO POO-PICKING or an additional charge will be incurred. The outdoor school and lunge pen can be used free of charge. The indoor school must be booked at a cost of 50p per half hour. There is a meter for lights at a cost of £1 per half hour.